Ascend Performing Arts, the parent organization of the Blue Knights, made several changes to its board of directors during an annual weekend retreat. Blue Stars announced the members of the corps’ 2016 percussion instructional team. The group will be led by caption heads Eric Shriver and Matthew Hernandez. Rory Duffey will step into the role of color guard caption manager for the 2016 Boston Crusaders. Previous caption head Lamar Branson will transition into the position of director of media and marketing for Inspire Arts & Music, the parent organization of the corps. Youth Education in the Arts, the parent organization of the Cadets, posted a job opportunity for a full-time development associate. The nonprofit is also searching for a finance manager. Carolina Crown named Travis Goodwin as director of marketing and education for the organization’s CrownSTORE, performance groups and Partnership in Education programs. The Cavaliers announced the members of the corps’ leadership team for its brass, color guard and visual captions. “We continue to prioritize consistency in our educational pedagogy and leadership moving into 2016,” corps director Mark Ackerson said. Led by caption head Oni Lara, Guardians announced the members of its 2016 percussion instructional team. Jersey Surf profiled corps alum Chris Gormley, who serves as a fire control technician for the U.S. Navy aboard a nuclear-powered submarine. Madison Scouts alum Kevin Houston was featured this week in the Omaha World-Herald for helping his daughter with cerebral palsy join her high school marching band on the football field. Oregon Crusaders made several announcements regarding staff members joining the corps’ brass, color guard and visual instructional teams. 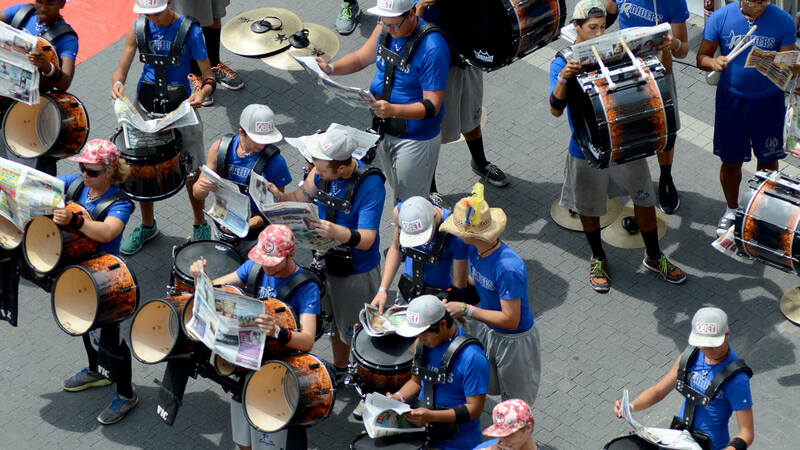 This January the Raiders will present a DrumLine Battle event in conjunction with the Shawnee High School Band Parent Association in Medford, New Jersey. Troopers made several new appointments to the corps’ 2016 brass staff.